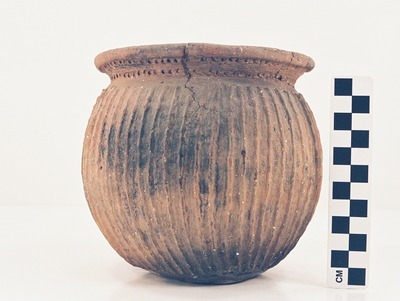 "41MR12, Burial I, 47" by Timothy K. Perttula and Robert Z. Selden Jr.
DECORATION: There are two rows of tool punctations on the short vessel rim, and multiple vertical appliqued ridges on the vessel body. The appliqued ridges extend from the rim-body juncture to just above the vessel base. Cass Appliqued jar from Burial I, MR12-47.